In the third quarter of 2017, Konecranes received a repeat order for two Konecranes Gottwald Model 8 Floating Cranes from Winning Logistics Company Limited (Winning Logistics). From mid-2018, the two new machines will transship bauxite off the coast of Guinea on the open sea. 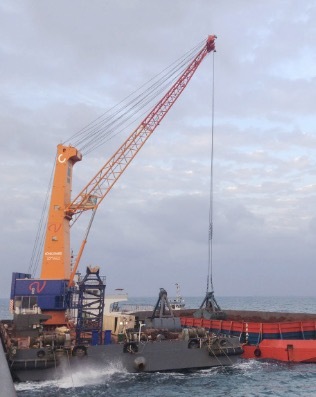 Winning Logistics, a member of the Singapore-based Winning International Group, has been operating Konecranes Gottwald Floating Cranes since 2015 when it began its bauxite transshipment activities. Since then its off-shore bulk handling activity has grown and the company has ordered two more Konecranes Gottwald Floating Cranes. Wang Chuanyang, General Manager, Winning Logistics says: “With the new delivery, our fleet will consist of six Konecranes Gottwald Floating Cranes, helping Winning Logistics to reach its growth objectives. The cranes play a key role in the supply chain of Guinea.” On its way from the mining regions to end-users, bauxite is shipped on river barges to the open sea where the floating cranes load it onto oceangoing vessels heading for Asia. Built for the open sea, Konecranes Gottwald Model 8 Floating Cranes are designed in accordance with the Lloyd’s Register Code for lifting appliances in a marine environment. They are able to operate at wind speeds up to 24 m/s and maximum wave heights of 2.5 m. The new machines feature 63-t grab curves and a maximum lifting capacity of 100 t, allowing the customer to lift project cargo such as heavy machinery.